This special offer allows you choose any 4 tours from our standard list of 20 tours below for the price of 3, saving you at up to £765.00 against booking the 4 options separately. There are a few conditions*: the offer applies to single full day tours by car only. 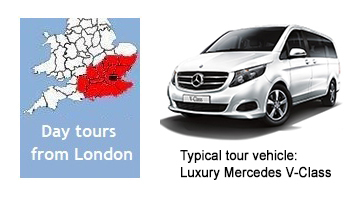 All tours must start and end in central London, have the same number of people (from 1 to 7), and take place within a 14-day period. Apart from that you’re free make up your own itinerary of tours. On all tour days your driver-guide will pick-you up from your central London hotel or place of residence at the specified time. Lunch can be arranged at an appropriate venue (tour price does not include food or refreshments). Think of the possibilities! You could mix and match by theme. For example, you might choose 4 history tours such as Tudors, Magna Carta, Winston Churchill and Battleships. These tours would include private guided visits to Tower of London, Hampton Court, Windsor Castle, Salisbury Cathedral, Churchill’s Bunker and Portsmouth Historic Dockyard. For a family of 4 the normal price would be £2,635.00. With this deal just £1,955.00, a saving of £680.00. Or, if you wanted a varied range of England tours you might select Canterbury & Dover, Cotswolds, Oxford & Blenheim Palace and Stonehenge & Bath. For a family of 4 the normal price would be £2,890.00. With this deal just £2,125.00, a saving of £765.00. ● Subject to availability. You are advised to book several months in advance. ● Tours included: Any single full day tour by car from our standard list of 20 tours as set out below. ● Tours not included: Harry Potter tour, Your Choice London tour, London tube tours, London walks, London museum or gallery tours, and any tours from the following pages: More London tours, More Tours from London, More History & Culture tours, Historic Towns, British TV, Movies & Books, Special Tours. ● Tours do not have to run consecutively but must take place within a 14-day period. ● Tours may be switched to suit attraction opening times and schedules. ● All tours must start and end in central London. ● All tours must include the same number of people (from 1 to 7). ● Price does not include entrance fees to attractions. ● Some attraction admission fees may have to be booked in advance. from London conducted by accredited driver-guide. 1-2 = enquire*; 3-4 = enquire*; 5-7 = enquire*. *Entry tickets to attractions are extra. Standard tickets may be booked in advance.